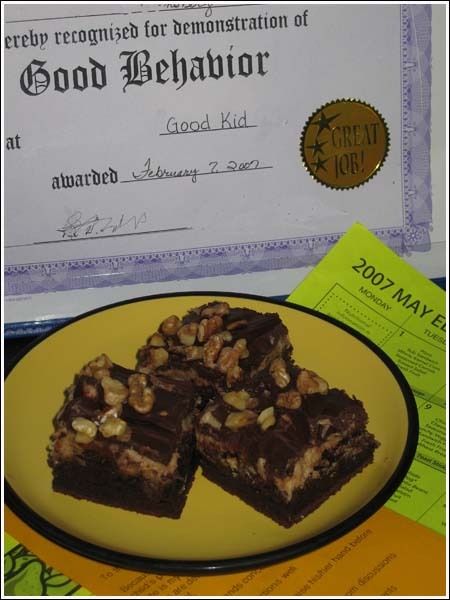 Chocolate Chip Cookie Dough Brownies are based off an old Bake-Off recipe. The original used a boxed brownie mix (made with eggs, oil and water) as the base. This version is similar, but with a scratch brownie base. These are very easy to make, but you’ll have to be patient because there’s a lot of cooling time involved. You can make them in a 9×13 inch pan as directed, or halve the recipe and use an 8 inch square pan. If you have a box of brownie mix around, the original version is a bit more convenient. You can save a lot of time and concentrate on the filling and topping. The only thing I don’t like about the original recipe’s filling is that it didn’t seem like enough, which is why I came up with a scratch version. Don’t let the length of the ingredient list scare you because many of the things are items you probably have around the house and many of the ingredients in the first part are just repeated down below. Brownies with a layer of cookie dough running through them. If you have some brownie mix on hand, you can substitute brownie mix brownies for the bottom layer. If you use this recipe, you'll get rather thick brownies. For thinner brownies with a higher ratio of cookie dough to brownie, make 3/4 of the base recipe but keep the filling and topping the same. Preheat oven to 350 degrees F. Line a 13x9 inch pan with nonstick foil. In a 3 quart saucepan, melt butter over medium heat. Stir in sugar and cook gently, stirring constantly, for about 1 minute or until sugar melts and mixture takes on a nice sheen. Remove from heat and stir in the cocoa powder until smooth. Stir in the salt and baking powder. Let cool for about 5 minutes, then stir in the salt and baking powder. Stir in the eggs (one by one), then add the vanilla, flour and chocolate chips (make sure batter is cool before adding chips). Spread batter in pan and bake for 25 minutes or until brownies are set. Let brownies cool on a rack for at least a half hour. Prepare filling. Beat together butter, salt (if using), both sugars, milk and vanilla. Add flour and stir until flour is incorporated. Spread this mixture over cooled brownies and place in refrigerator for about 30 minutes to help firm up dough. 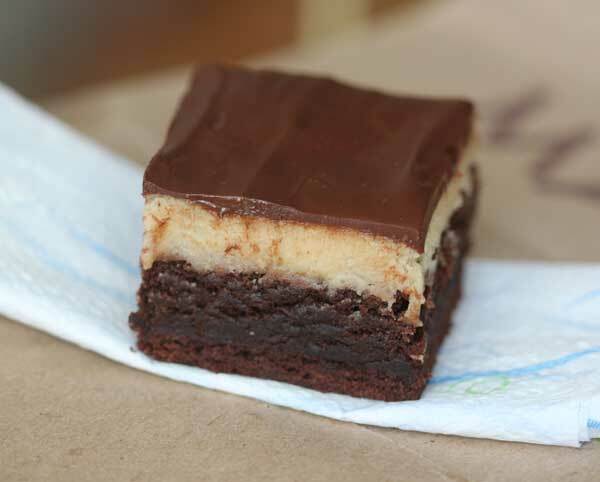 Alternative, you can press the mixture into a 13x9 inch rectangle between two sheets of plastic wrap, then carefully invert it onto the brownies. In a microwave-safe bowl or in a double boiler, melt chocolate and butter. If using a microwave, combine chocolate and butter and microwave on high for 30 seconds. Stir and repeat until melted. Spread melted chocolate mixture over cookie dough. Sprinkle walnuts over top. Allow chocolate to set, then lift from pan and cut into bars. Love cookie dough. Seems like I’ve made something like this before but it wasn’t so good…I think that chilling it would have helped a LOT! May have to try this sometime. Thanks for the recipe.